Most job creation comes from small firms--and so does most job destruction. The Congressional Budget Office has a useful summary of the evidence in a short March 2012 report, "Small Firms, Employment, and Federal Policy." Here are some basic facts about firm size and employment. 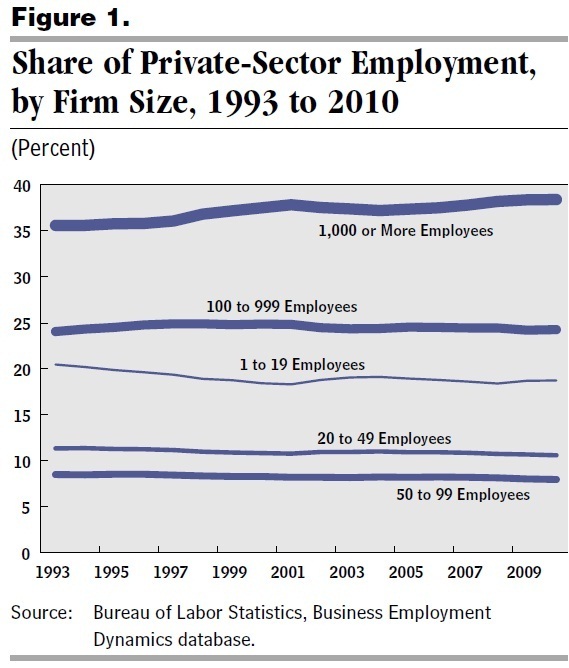 In 2011, firms with more than 1,000 employees were 0.2% of all firms, but 38.6% of all private-sector employees. Conversely, firm with fewer than 19 employees make up 87.5% of all firms, but have 18.4% of total employees. Here's the detailed table. 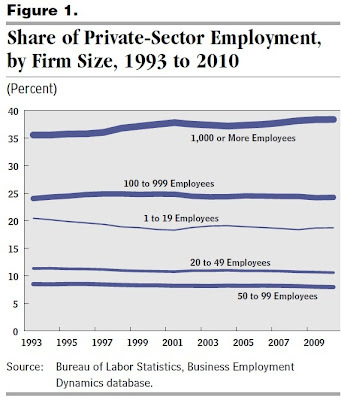 The share of private sector employment by firm size has barely budged in recent decades. The share of employment in very small enterprises of 1-19 employees is down a few percentage points, and the share of employment at the largest employers of over 500 employees is up just a touch, but the overall stability of these patterns is remarkable. Studies of the effect of small firms on employment often seem to reach mixed results. One reason becomes clear if you think about this figure for a moment. If small firms grow enough in size, they aren't small any more. So does that mean that small firms stop contributing to employment growth if they get larger? Conversely, imagine a large firm in a death spiral, bleeding employees until it becomes a smaller firm. Does this now become an example of a small firm that is losing employees? If people are laid off at big firms, and then try to start small companies, is this evidence of the dynamism of small firms--or of a sick economy? The emphasis in recent studies of small firms and employment is in adjusting for the age of the firm. "Recent research, however, has found that it is young small firms, especially start-ups, that grow faster—and consequently create jobs at a higher rate—than either large firms or established small firms do. One study found that the smallest firms, those with between one and four employees, grew 4.7 percent faster than the largest firms, those with more than 10,000 employees. However, when the comparison is made between firms of the same age, small firms grow more slowly than large firms do. "Almost all firms start small. Many fail and, of those that do survive, most have no desire to expand beyond “small firm” status. Only a few grow substantially and become large firms. Thus, the faster average growth of young small firms is driven by the ambitions and successes of a fairly narrow set of start-up employers." In other words, the issue isn't about small size, but rather about whether the firm is in a line of business that offers possibilities for dramatic expansion. Many small firms like certain retail stores or various personal and professional services, don't have much potential to expand substantially, and aren't really seeking to do so. I remember a venture capitalist, who would be expected to be sympathetic to good news about small firms, once telling me: "The thing you need to remember about small firms is that a lot of what they do is sell to bigger firms." I'm not sure that statement is true about small firms in general, but I think it was true in terms of what he was looking for: that is, firms that were currently small but had potential to link to a much wider market. Japan Has a Trade Deficit?!? FX Markets: $4.7 Trillion Per Day? How Has Structured Finance Evolved? Want to Watch Bernanke Lecture? What Should Banks Be Allowed To Do? A Third Kind of Unemployment?